At the XXIX IAU General Assembly held in Honolulu from 3-14 August 2015, the meetings known as Special Sessions and Joint Discussions were replaced by new 'Focus Meetings'. Astronomy in Focus XXIXB presents the most relevant contributions from the Focus Meetings together with summaries of all the accepted papers and posters. It covers the following topics: the legacy of Planck; x-ray surveys of the hot and energetic cosmos; stellar physics in galaxies; stellar explosions; gravitational waves and structure formation; the search for water and life's building blocks; red supergiants in the local Universe; advances in stellar physics from asteroseismology; scale-free processes in the Universe; and the frontiers of our understanding of cluster and galaxy evolution. 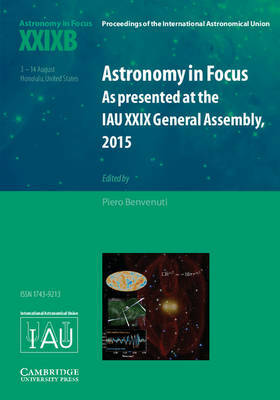 The publications Astronomy in Focus XXIXB (together with its companion, XXIXA), the proceedings of the six main Scientific Symposia and Reports on Astronomy: Commission Legacy Reports, fully cover the XXIX IAU General Assembly.